There are a lot of choices when it comes to food in South Dakota grocery stores and farmers markets. “Low fat,” “gluten free” and “non-GMO” are just a few of the labels companies add to packaging to stand out and appeal to your dietary preferences. While they may be helpful, these labels can also lead people to wonder about the safety and health of foods without labeling claims. “Organic” is a great example of this because foods grown using organic and conventional practices are equally safe and nutritious, but organic foods receive a little extra attention. That’s because organic farmers go through a certification process that requires them to use some different practices. However, you may be surprised to know that conventional and organic farmers are more alike than you think. In the past, we’ve explored ways organic farming is different than conventional, so today we’re looking at some of the top similarities. Families own and operate 97 percent of the farms in South Dakota. There are approximately 31,000 farms in the state and about 103 are certified organic. Whether they use organic or conventional methods, there’s almost always a family behind the food you eat. Conventional and organic farmers can both use pesticides to control harmful insects. The difference is that organic farmers can’t use most synthetic substances, while conventional farmers can use any type of pesticide deemed safe by the USDA. No matter what they use, by the time the food reaches grocery store shelves, it’s safe to eat. In fact, a woman could eat 850 servings of apples in a day with no effects from pesticides. See for yourself. Farmers who use conventional and organic methods seek ways to improve their farm practices each year to protect the land for future generations. Environmentally friendly practices like crop rotation, no-till farming and cover crops protect and preserve the land, and aid in improving soil quality. Composting and applying animal manure also fertilize the ground. Organic and conventional farmers who raise animals care about their safety and want to keep them healthy and comfortable. They protect them by providing shelter in barns, making sure they have access to water and feeding them a healthy diet of soybeans, corn and vitamins. Soybeans – grown organically or conventionally – are a favorite protein-packed meal for pigs, chickens, turkeys and cows in South Dakota. Farmers work with veterinarians to treat sick animals. Though organic farmers cannot use antibiotics to treat them like conventional farmers, they can use some vaccines and pain medications. Foods raised organically and conventionally must meet safety standards set by the USDA. South Dakota farmers grow and raise foods that are healthy for your family and theirs. The methods may be different, but safety is a top priority for all family farmers. The next time you’re in the grocery store trying to decide between the organic and conventionally raised strawberries, you can feel confident you’re making a safe and healthy choice no matter which carton you pick. Keep growing your food-shopping knowledge by reading about meaningless food labels and if paying a little more for organic is worth it. do you use gmo seeds? do you use only organic manure to fertilize? do you use any poisonour pesticides? What do you use for pesicides? Thank you. Perhaps my understand is incorrect. Please tell me the truth about the label “organic” and what does it mean? Are your animals ‘grass fed’ and non gmo fed? Thank you for your questions. We love hearing from people and having conversations about how food is grown and raised on today’s farms. The point of this blog was to share that many farms in South Dakota are still family owned, organic and conventional farmers can use pesticides to protect crops if they choose but they adhere to different requirements, most farmers are improving farm practices to take better care of the environment and their animals. Above all, farmers want to grow safe food for families. 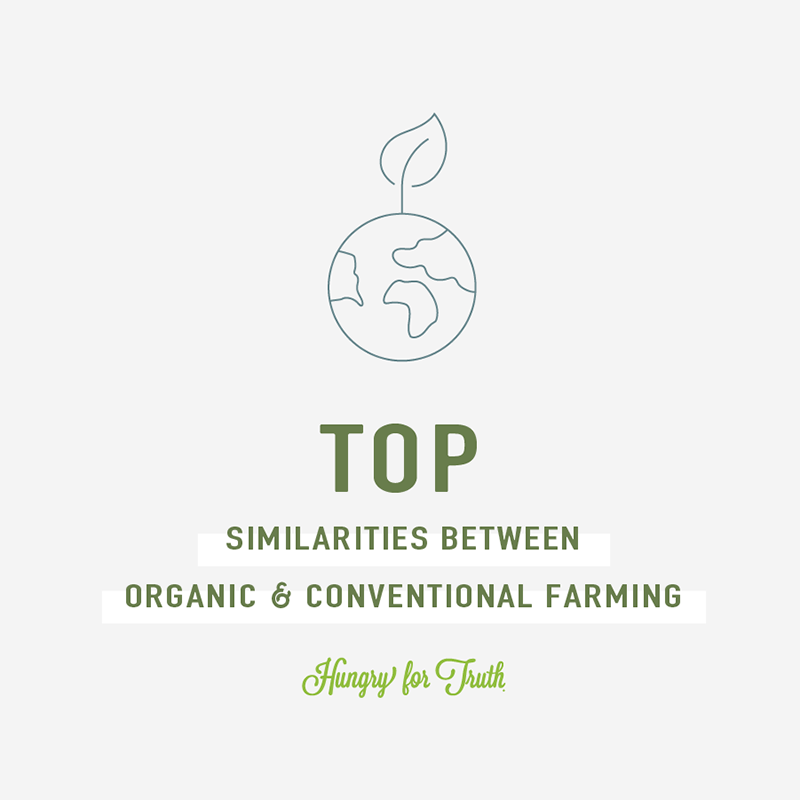 Many times people focus on the ways organic and conventional farmers are different so we wanted to highlight some of the similarities. We support choice when it comes to farming and the foods people buy to feed their families. As far as your other questions, those seem like they would be better answered by a farmer. Would you like us to put you in touch with one via email? Thank you for the information. I used this page for a compare/contrast paper I am writing and it was very helpful! Who is the author? So glad to hear it was helpful. You can just attribute it to the Hungry for Truth initiative. Thanks!